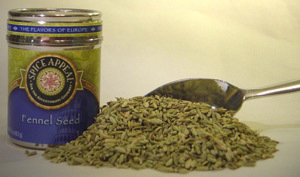 Referred to as “marathon,” fennel seed represented success in battle to the ancient Greeks. Its fresh, camphoraceous, aroma with bittersweet, licorice taste complements many European and Mediterranean dishes. Used in Italian cooking to flavor sausages, pizzas, meatballs, salami and pepperoni. Adds a unique sweetness to Spanish cakes and baked goods. Complements rich fish sauces, roast pork, mutton and lamb curries, sweet and sour dishes, roast duck and cabbages. Recommended for oily fish such as mackerel and salmon.